Singularity Hub has faithfully followed flexible displays over the last few years—but now researchers are hard at work fabricating flexible components to match. 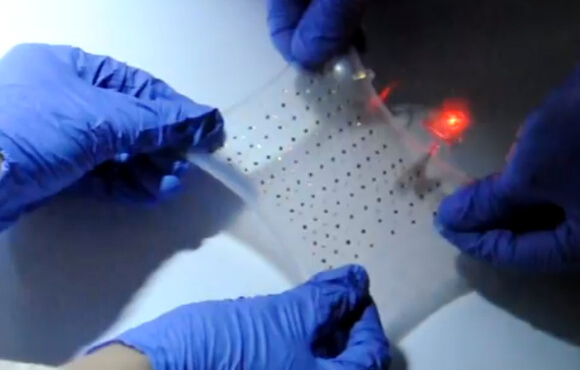 In a recent paper, Yonggang Huang and John A. Rogers of Northwestern University and the University of Illinois demonstrated a lithium-ion battery embedded in a rubber substrate that can be stretched, folded, twisted, and charged wirelessly. Lithium-ion batteries are the power source of choice in mobile devices from laptops to cell phones these days. Making them flexible and pairing them with flexible displays like OLEDs and (yet to be invented) CPUs may lead to fully flexible devices. Though Rogers and Huang have prototyped flexible lithium-ion batteries in the past; that the battery now charges wirelessly is more novel. Applications may include implanting their invention in the human body—where flexibility and wireless charging are key—to measure vital signs or brain activity. Huang and Rogers’ battery is neat, but it isn’t the only candidate for flexible batteries—in fact, the competition is pretty stiff. Flexible lithium-ion batteries could be rendered obsolete by graphene-based components. It’s exciting times for graphene research. The European Commission Europe just awarded a consortium of 100 research groups €1 billion euros for research over the next decade. (It was one of two projects to receive a billion—the Human Brain Project was the other.) But even so, practical uses may be a few years away. And maybe that’s where Huang and Rogers’ flexible lithium-ion battery fits in—meeting demand for flexible components during the years of graphene research ahead. Or maybe graphene will be a bust in practical uses. Or perhaps there will room for both in the future. Nothing wrong with having multiple options for various applications.